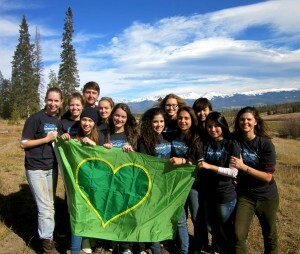 A couple of months ago, I was one of the trip leaders for a group of high school exchange students traveling to Colorado. These students are here for the year and had arrived in early fall. They were placed with host families all over the country, but they had decided to go on one of the trips that CCI Greenheart, their exchange sponsor organization (and where I work), offers throughout the year. The trips are a mix of fun activities and volunteering, where they can learn about community service and meet other exchange students from around the globe. This particular trip was to Snow Mountain Ranch in Granby, CO, up in the mountains outside of Denver. And I was lucky enough to be selected as one of the people to lead the trip. Every day was packed with activities. Each morning we would hike up into the mountains to take in the beautiful scenery, and after lunch we would do a volunteer project or other fun activity like zip lining. In the evenings, we would have workshops where we would talk about what it means to be a volunteer and how we can get involved in our communities. One of the nights, we showed the film. This was a new experience for me, as I had not yet been present for a screening of the film to such a young audience. I realized, as I sat there watching with the students, that this was one of our target audiences. These were the types of people that we most wanted to reach – the young people who have the energy, optimism and lives ahead of them to create their own path and make a difference in what they’re passionate about. Not only that, but they were also an international audience. They represented 9 different countries, 9 different places where they could spread the messages of the film. I felt a little nervous as I waited for the film to end, anxious to hear their comments. It was an honor to show the film to such a bright group of motivated people from around the world, ready to make a difference. That is what it’s all about.